1)Take the two cups of curd in a bowl. Add salt as per taste and mix well. Keep aside. 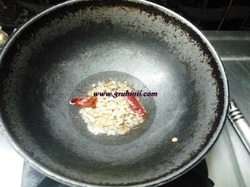 3) Add oil and put the urad dal, channa dal, jeera seeds, mustard seeds and red chilles. Fry them. 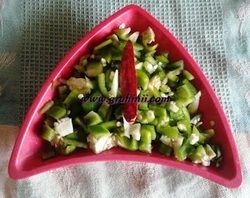 4) Now add the chopped Capsicum, onion and green chillies. Let them fry till onions turn golden brown color. Simmer the flame and close the lid and allow to cook for 5 min. 5) Add a pinch of turmeric to it. 6) Now switch off the stove and add the contents to the curd prepared earlier and mix them properly. Garnish with chopped coriander leaves or you can directly take to the serving bowl and serve it.